It is highly probable that they were transported to and arrived in the Port of Seattle as egg cases attached to wood, etc., rather than as mobile organisms. Considering the seasonal nature of the hobo spider, it is highly unlikely that a viable breeding population would have developed in the United States based on the occasional introduction of adult or juvenile specimens. The Hobo spider is native to Europe. The hobo spider is a resident of fields, rarely entering human habitations due to the presence of major competitors, particularly the giant house spider, Tegenaria gigantea, which is a common resident of houses and other man-made structures in Europe; thus, human contacts with the hobo spider are uncommon in Europe. 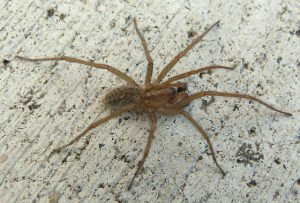 In the United States, however, the hobo spider rapidly adapted to living in urban areas, and without the widespread presence of a dominant competitor, became abundant and began to extend its range; by 1968 it had become established as far east as Spokane, Washington and Moscow, Idaho, and as far south as Corvallis, Oregon.